Twiggi will be among the many top acts scheduled to be a part of the celebration being held to honor the great reggae singer Marcia Griffiths, OD for her outstanding contribution to the development of Jamaican music over the past 45 years. The world renowned singer will be honored as part of her birthday celebration to be held on November 21, 2009. The venue for the show will be the Grand Ballroom Of Sunrise at West Oakland Park Blvd. in south Florida. The event dubbed "It's Electric Boggie Woogie Woogie " after one of her most major international hits will be staged by CRM Multimedia and will be hosted by Jamaican radio personality John T of Radio WAVS 1170. The name Marcia Griffiths has always been associated with excellence. 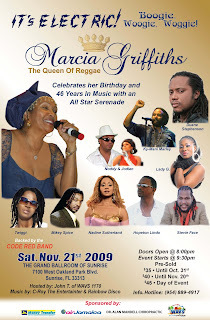 Dubbed the Empress of reggae music, over the years Marcia has established herself as Ambassador of Jamaican music. Twiggi has been quoted as saying recently "I am both excited and honored to get this opportunity to help celebrate the work of such an iconic figure who paved the way for all women in reggae music today, she is an inspiration to all Jamaicans both young and old and especially to myself." Tickets for this highly anticipated event are on sale now. For more information contact the information hotline at (954) 889-4917. For more information, promos requests or to set up an interview, please contact Dimmie Joe Muzik at:dimmiejoemuzik@gmail.com or for up to date information visit us on MySpace at: www.myspace.com/twiggimarie or www.myspace.com/dimmiejoemuzik.